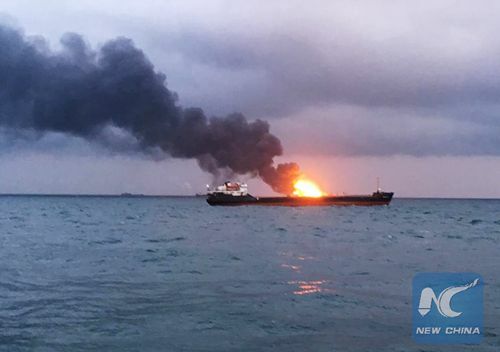 At least 11 people were killed after two ships caught fire in the Kerch Strait connecting the Black Sea and the Sea of Azov, Russia's Federal Agency of Maritime and River Transport (Rosmorrechflot) said Monday. "Latest data indicates 12 people alive and 11 dead," Rosmorrechflot's press service was quoted by Sputnik news agency as saying. Previous reports showed that 10 people were found dead and 14 others were rescued. A total of 31 sailors, including Turkish and Indian nationals, were reportedly on board the two Tanzania-flagged LNG tankers. The search and rescue operation is under way. According to preliminary information, an explosion occurred on one of the vessels and set it on fire, which spread to the other ship later on. The accident took place when fuel was pumped from one vessel to the other, Rosmorrechflot said. There might have been a violation of safety rules during the fuel pumping process, Tass news agency reported, citing a source from local emergencies service.